So here’s a question: If you make your digital humanities project so that the product is a gorgeous website with swoopy interactive capabilities and lush soundscapes, will people engage with it on a deep scholarly level, or will they get stuck in the flash and glam? This was a question that came up today at a DH workshop on campus, and it got me to thinking about a similar question that had come up at THATcamp in Denver last year — how much web design do you need before people will pay any attention to your site? People make snap decisions about website credibility, and they do so largely unconsciously, so research suggests that if you make your site look nice, people will stay on it rather than move on to look for something “better.” This is what people at THATcamp were talking about last year — the need to have enough web design built into their DH projects that their projects will be taken seriously. On the other end of the spectrum, if a site is TOO beautiful, I start thinking it’s likely to be trying to get money from me. All the money for the custom designing and maintenance has to come from somewhere, right? Likewise, I’m not at all used to seeing scholarly books come out with incredibly designed covers, glossy pages, and custom illustrations. So maybe there’s some spot part way between “grungy” and “flashy” that would appear the most credible for scholarly DH work. The question is, where along that continuum is the sweet spot? I disagree. Design is decision-making, not decoration. “Flash and glam” is only good design if it contributes to functionality, usability and meaning. Personally, I find that “swoopy interactive capabilities and lush soundscapes” often have the opposite effect. They call attention to themselves and detract from the experience of the site – bad design. Yes, I totally agree that design is far more than decoration — that it is fundamental to usability and meaning-making. What I’m saying here is that there may be an odd trade-off for certain audiences. For academics, it’s possible that the very first impression, the one we make unconsciously in the first seconds of seeing a website, is that if so much time, money, and energy went into the design elements, perhaps not enough time and energy went into the deep analysis that this audience values above all else. There are those who will immediately reject something that doesn’t look just like what they’re used to. That’s probably why so much scholarly writing looks like it comes from the days of manual typewriters. And that’s all the more reason to push for better design. I think that if time and energy is invested in good design, the deep analysis would become more readily apparent. Better design = better communication. Sorry if I come across as ranty. I was a designer before I became a librarian. Let me clarify, I am NOT advocating bad design. Bad design does nobody any good, and I agree that good design should be the goal all the time. What I’m saying, or rather thinking and wondering about, is that some of the elements that make for good design in, say, the business world, are not necessarily the same elements that make for good design in a piece of scholarly output. 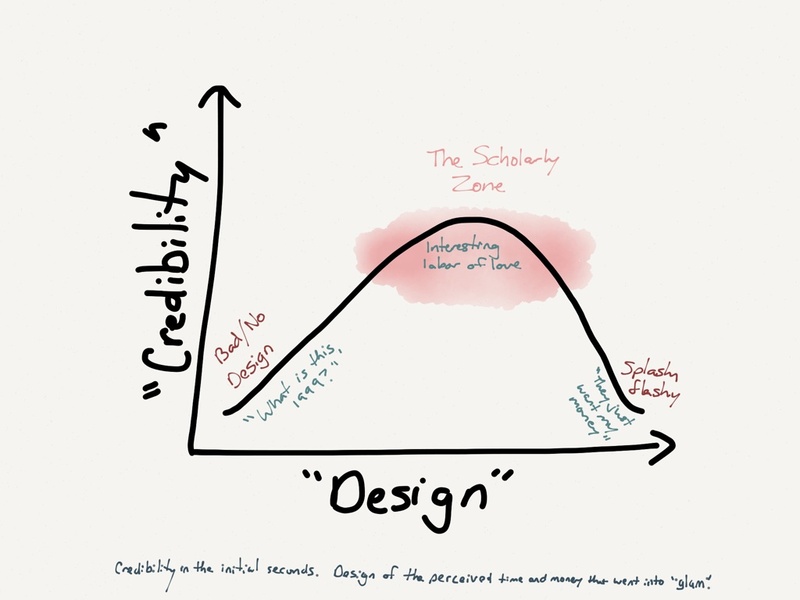 Based on the conversations I heard, I’m thinking about how there may be norms within scholarly communities of practice that matter for web design. These norms, like all norms, will probably shift over time, but right now, it’s interesting to think about what would make for exceptional web design that would also fall within the tacit criteria for “credible” that matter to this community of practice. I think it’s possible that the sweet spot between “grungy” and “flashy” is just short of where the “flashy” interferes with functionality. So for example, lush soundscapes would be seriously annoying for me as a scholar trying to interact with a text; I don’t want to waste time trying to figure out how to shut off the stupid sound. Likewise, swoopy page-turning effects are lovely, but not if they slow down the process of flipping through the text. Yes, I think when we were talking about “over-designed” sites in the workshop, “design” meant something other than the deep fundamental elements that facilitate interaction, understanding, and functionality. I wish I knew of a term that means the “flash and glam” kind of design aesthetic that doesn’t also mean “truly functional, usable, and interesting” design, because that’s what I meant to be talking and thinking about. I think there’s a definite place for flash and glam, and I’m in awe of many sites that pull that off well. I think what I’m after here, is some way of describing the range of very good design — exceptionally good design — that gets out of the user’s way and facilitates deep engagement with information. This is design that will fall within the norms of the community of practice, that will privilege the community’s highest value (intellectual work) and not making them worry about things that cause suspicion (monetary gain, being hoodwinked, etc). I think about this quite a bit, though not as coherently as you’re doing here, mostly because I look at a lot of foundation websites that exhibit varying degrees of “flash.” Foundations (at least the ones I work with) tend to exist between the corporate world, where their money tends to come from, and the academic or nonprofit worlds (where their money goes), so their websites often have a kind of uncomfortable and even unpleasant hybridity – flash (and even Flash) for its own sake, to satisfy some manager’s sense of what’s cool, but lots of text so that applicants are reassured of the foundation’s seriousness and, of course, can actually find stuff out. I think that people in the academy – faculty and staff alike – are much more comfortable with and predisposed to like text and to distrust or at least ignore pretty much everything else – unless there’s a clear reason for, say, a graphic (such as a chart showing funding rates). It’s probably embedded in our DNA. When I worked at a for-profit university, the coworkers with business backgrounds often tried to minimize the amount of text on screen or on pages in favor especially of graphics that were supposed to, but often didn’t, do a better job of communicating information. Inasmuch as they were worried about “design,” they thought of it as “flash and glam,” not thinking through complements to the written word. There’s a bit where a professor of women’s studies gets an invitation to present at a conference in a luxurious, warm destination, during the winter months, on creamy white stationery with lovely printing and whatnot, and she reflects on how she fundamentally DOESN’T TRUST the organization sponsoring the event (for good reasons, as it turns out) and how she puts a great deal more stock in organizations whose public communications are visibly grubby, even to the point of still using a mimeograph machine, because that’s all that they can afford because they don’t charge much, if anything, in membership fees or conference fees and are perpetually skating on the brink of bankruptcy and collapse.